As the weather turns chilly and the nights get downright cold, you probably relish the opportunity to break out your cozy sweaters and woolen coats and layer to your heart’s content when you leave the house. However, you also need to consider how to keep your home interior comfortable when the temperature begins to drop. The last thing you want when you fire up your furnace is to experience weak air flow, tepid air, or worse, no response at all. When you crank the thermostat, you want your home to warm up. This requires regular maintenance to ensure your home central heating system is functioning as it should before you find yourself in need of heating. The experts at Rowland Air are more than qualified to lend support and even help with central heating maintenance, repairs and upgrades should the need arise. Your homeowner maintenance checklist includes items like cleaning the gutters and flushing the water heater annually, and it should also include regular inspections of HVAC components, including an AC inspection in spring and a furnace inspection in autumn. Why is this so important? When you regularly clean, maintain, and repair components, you’re going to extend the usable life of your HVAC equipment and make sure it delivers optimal performance year-round. 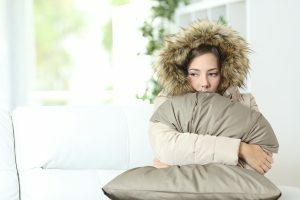 Most importantly, you know when you demand heat from your system, it will deliver, so you don’t have to worry about a break-down at the worst possible time. With a proper maintenance schedule in place, you shouldn’t have to worry too much about repairs, but over time, wear and tear could cause parts to break down, requiring repair and replacement. Staying on top of these minor repairs will spare you major expenses over the lifetime of your equipment. Eventually, of course, you’ll reach a point where it makes sense to replace old, outdated, and deteriorated equipment so you can enjoy the latest advances, including energy-efficient equipment that saves you money on utility bills, as well as increasing repair costs. The good news is that Rowland Air partners with the biggest names in HVAC equipment manufacturing, delivering options to suit the needs of every home and homeowner. Whether you want to get on a regular maintenance schedule to extend the life of your current home central heating system and other HVAC components or it’s time for an upgrade to the latest and greatest technology, contact the qualified professionals at Rowland Air today at 800-500-9068 to schedule your free consultation and learn more.